Why the hell is this man treated as a serious thinker by the mainstream press? Once again this morning, Erickson found himself a guest panelist on Meet the Press, and he was asked about the conservatives spreading conspiracy theories in the wake of deranged Trump supporter Cesar Sayoc mailing out over a dozen pipe bombs to high-profile Democrats and CNN. Prior to Sayoc being arrested, prominent right-wing figures espoused “false flag” theories on the bomb scare, claiming the bombs were part of a Democratic plot to impact the midterm elections and distract from the migrant caravan. Host Chuck Todd asked Erickson to address this issue while briefly alluding to the fact that the Resurgent editor himself has played a part in spreading right-wing conspiracies. Todd, however, seemed more interested in getting Erickson to discuss the overarching problem and not do any self-reflection, essentially giving him an out. 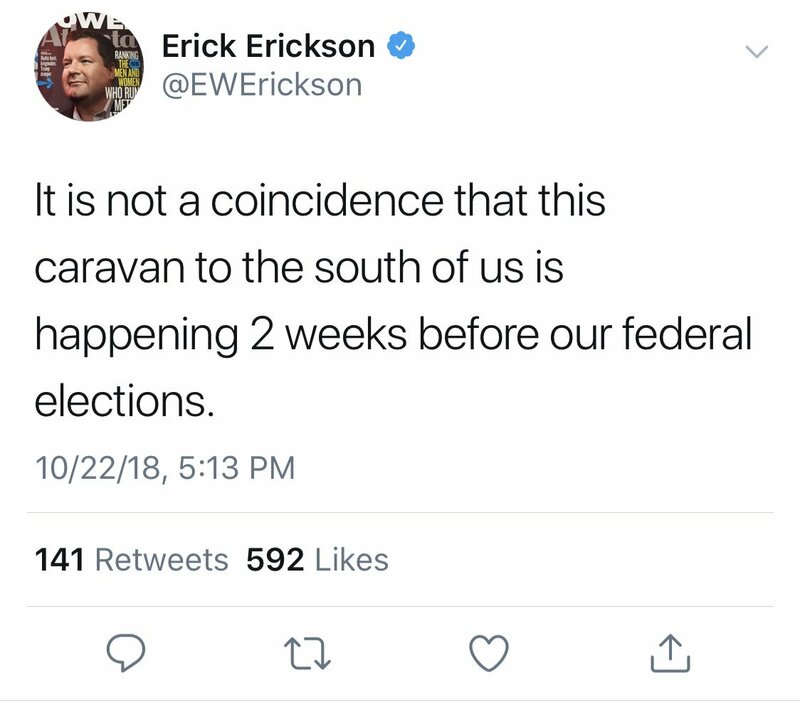 Meanwhile, just six days ago, Erickson was loudly hinting that the migrant caravan was part of a Democratic effort to affect the elections. Erickson went on to condemn conservatives such as Rush Limbaugh for amplifying baseless “false flag” claims and conspiracies even after facts arise to debunk them, stating that “if you’re a conservative who’s at war with the truth, you’re not really being conservative.” While Todd focused on Limbaugh’s recent comments, Erickson made generalized statements about how conservatives distrust the media and get their information from elsewhere, bemoaning the lack of community in our current society. Now, that’s all well and good, except that Erickson has been a key voice in seminating fringe theories and conspiracies for a while now, and besides the migrant caravan remarks he has recently pushed other wild and fact-free rumors and claims. Specifically during the highly contentious Brett Kavanaugh confirmation, which saw the former NeverTrumper embrace the president and go to war with liberals and Trump critics. After Christine Blasey Ford came forward with her sexual misconduct allegations against Kavanaugh, Erickson seemingly embraced pretty much any crazed theory that bubbled up. He parroted an 8chan claim that Ford’s lawyer was closely associated with Hillary Clinton, pushed the theory that a friend of Ford’s conspired with Prett Bharara to leak Ford’s initial letter to the media, and hyped up Ed Whelan’s doppelganger theory days before Whelan unleashed it to much ridicule.